Because this time, the whole state was watching. No. 1 vs. No. 3 in the AP polls. And the Union Titans rallied from a 14-point, fourth-quarter deficit to beat No. 3 Puyallup 38-31. Now, a few days later, Union coach Rory Rosenbach said that perspective was pretty much spot-on Friday night. The student section, the band, the whole crowd on both sides of the stadium, made for a special occasion. “The fun part was talking to administrators and teachers who had been here a long time. That might be the best crowd we’ve ever had,” Rosenbach said. “Everybody was engaged for four quarters. Clearly it had a big-time playoff feel to it. “Just a fun game to be part of,” he added. Union tralied 31-17 early in the fourth quarter. “The crazy part was we just never felt like we were out of it,” Rosenbach said. The Titans were driving the ball. Had a few mistakes here and there that kept them from finishing. Rosenbach knew they were going to be fine when quarterback Lincoln Victor threw an interception. No, trust me, this was a good thing for the Titans, Rosenbach said. Victor did not want to talk about it because he already knew what the mistake was, and he was ready to focus on the next series. A perfect quarterback mentality. Make a mistake. It’s over. Move on to the next play. Then it was a touchdown-stop-and-touchdown for the Titans to tie the game. Another stop led to Union getting the ball and scoring with 15 seconds left for the victory. “For whatever reason, the momentum builds and it just avalanches,” Rosenbach said. Give credit to the Union offensive line, the coach noted. The Titans wore down Puyallup in the fourth quarter. Those three touchdown drives to win the game? More than 50 percent of them were run plays. As noted last week, this non-league game has more meaning now than it ever did previously in the state. For the first time, the WIAA is using a committee to seed the state playoffs. In the past, non-league games were for bragging rights but nothing more. Union still has to qualify for state through league and then the Week 10 preliminary round playoff. But should the Titans get there (as expected), the wins against Mountain View, El Cerrito, Calif., and now Puyallup will go a long way toward earning a top seed. Oh, and all three of those games were close, and all three times, Union made more plays in the second half to earn the victories. First, though, the Titans have to take care of business in the Class 4A Greater St. Helens League. That starts this week for Union when the Titans take on Skyview. Kickoff is 5 p.m. at Kiggins Bowl. “We all know they are going to be really well coached,” Rosenbach said of the Storm. “You know they’re going to be physical. They’ll have a good run defense. People aren’t high on them as in the past, but we know they’re going to bring it. The Storm remember last year, and they don’t like the memory. It is still rolling along at Union, too. 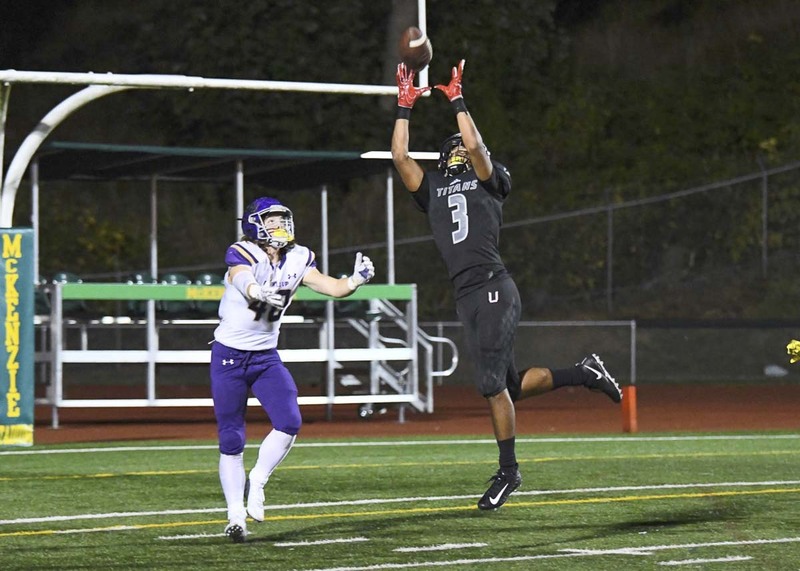 The Titans rallied to beat Puyallup last week, and Kizer said he had a blast just watching the game on HUDL. Now the Storm get to try to stop Union again. Still, this is Skyview. The Storm are not going into Friday hoping to just keep it close. Beating Union would be a huge step toward that mark. The Storm understand most do not expect them to win Friday, but they are going to show up anyway and give it a shot. Skyview running back Jalynnee McGee, who has been out since Week 3, is doubtful to return for this matchup, the coach said. McGee has to clear some medical tests before returning to the field. 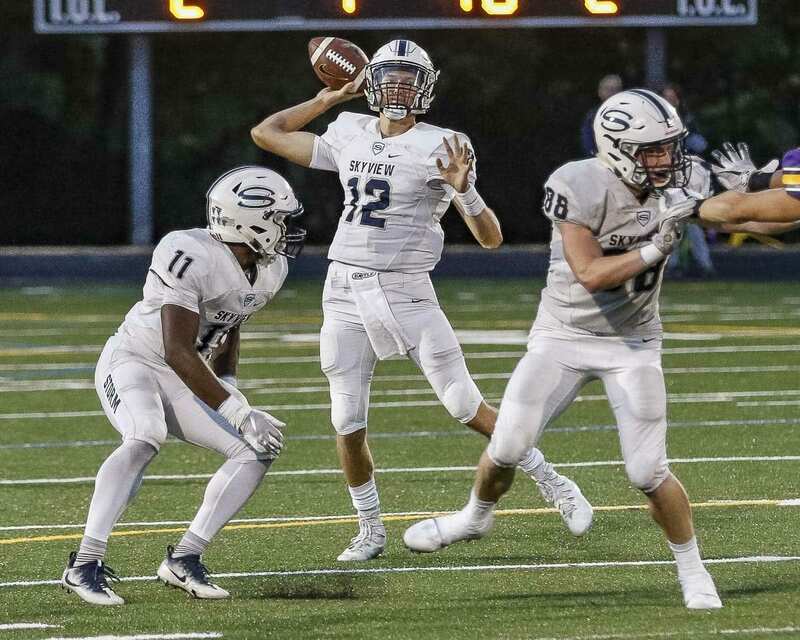 The Camas Papermakers started on out defense, got a fourth-down stop on the first series of the game, then scored on their first play on offense last week. Just like that, the Papermakers were 1-0 in the Class 4A Greater St. Helens League. Eight different Papermakers found the end zone. It has been an unusual season for the Papermakers. It is not the norm for Camas to lose a couple regular-season games. Hadn’t happened this decade, in fact. But Camas lost in Week 1 by two points when a wild late-game rally fell just short. The Papermakers responded with back-to-back wins, then lost to Bellevue on the final play of the game. It was strange to see Camas at 2-2 after Week 4, even if the two have come against quality competition. The Papermakers have dealt with it by preparing in practice. In their three wins, they have outscored opponents 184-17. The Papermakers got to 1-0 in league play and go back outside of league this week. “Our players have responded, and we look forward to getting back to game day — especially on TV Thursday night,” Eagle said. That’s right. Camas will have another strong opponent to face. The Papermakers kick off Week 6 with a Thursday game against Sumner, which will be broadcast on Root Sports Northwest. Oh that score looks bad. No one likes to be on the wrong end of a game like that. Heritage coach Matt Gracey said he wants to make sure everyone knows that Camas did not run up the score on his team. It was just a perfect storm of his team being short-handed, turning the ball over way too many times, and playing against a quality team. Gracey said if the Papermakers wanted to on this night, they could have scored a lot more. Gracey, in fact, appreciated the approach. Nothing was done to try to embarrass the Timberwolves, but the Papermakers kept playing hard. In the long run, that makes both teams better, Gracey said. Heritage had some moments, too. In the first quarter, the Timberwolves put together a 15-play drive, which included a fourth-down conversion. It ended on a 32-yard field goal by Israel Gonzalez, a freshman. The Timberwolves have been crushed by injuries this season, including their starting quarterback. There were so many turnovers, though, it led to short fields for the Papermakers, which allowed the score to get away from the Timberwolves. “Take the turnovers out of it, and I was impressed,” Gracey said. “If you can be impressed with a loss of that magnitude. “We didn’t have any business winning that game, but we certainly got better,” he added. The Tigers played against a good team in Week 5 and then gave that team so many extra yards, according to coach Mike Kesler. “It’s tough to win a game when you give up about 150 yards in penalties on defense,” he said. The Tigers were a bit overaggressive, he said. On offense, the Tigers had some good drives but did not finish. Daniel Thompson and Trent Thompson scored the touchdowns for Battle Ground. Next, though, is an opportunity. The Tigers went 0-4 in league play a year ago. The closest game they played was against Heritage.